The fjords of B.C.’s Central Coast are home to an astounding abundance of marine life including fragile deep-sea corals and sponges and the rockfish they provide habitat for. 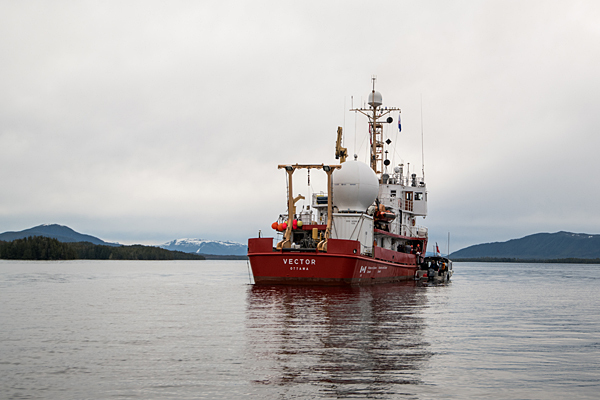 While First Nations Elders have long spoken of this profusion of life, traditional Indigenous knowledge is now backed up by scientific data gathered during an expedition aboard the Canadian Coast Guard research vessel Vector. Scientists visited Kynoch Inlet, Seaforth Channel and Fitz Hugh Sound in March 2018 as part of a collaborative survey between Fisheries and Oceans Canada (DFO), Oceana Canada, Ocean Networks Canada, the Central Coast Indigenous Resource Alliance (CCIRA), and the Heiltsuk and Kitasoo/Xais’Xais First Nations. The Marine Plan Partnership’s (MaPP) Central Coast Marine Plan includes objectives and strategies for identifying and closing information gaps – and there is much to learn about marine life far below the water’s surface. 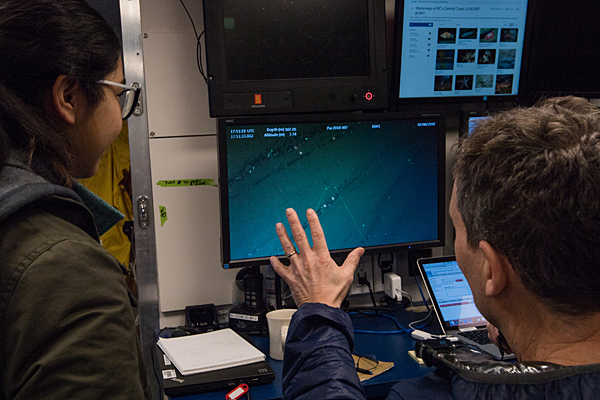 The expedition used a camera capable of filming at depths of more than 2,000 metres—much deeper than previous studies had access to. 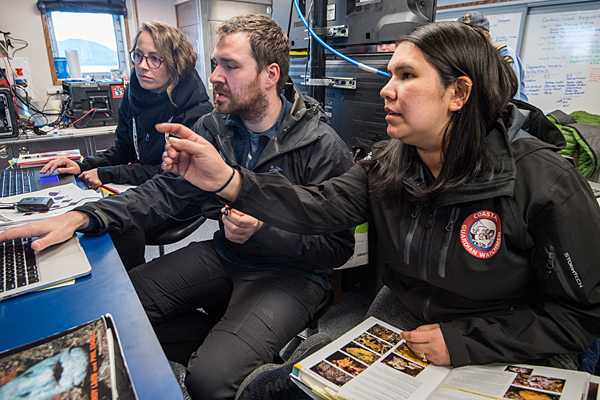 All the partners were enthusiastic about the expedition’s community engagement component that was led by Maia Hoeberechts with Ocean Networks Canada. With a 158 mm-wide carapace, this European green crab (Carcinus maenas) trapped by the CCIRA monitoring team is unusually large: on the Central Coast, the observed average is closer to 50 mm. Females can release up to 185,000 eggs once or twice per year, and larvae can drift around 50 to 80 days in ocean currents before settling to the sea floor. Image courtesy of CCIRA. Four First Nations are partnering with the Province of B.C. to implement MaPP on the Central Coast through a coordinated response to three aquatic invaders: European green crab, tunicates, and bryozoa. 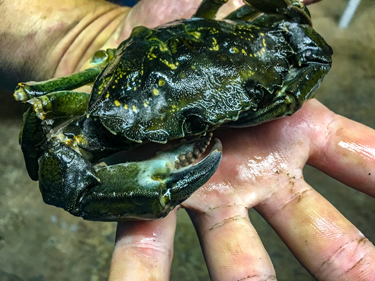 Originating in northern Europe, green crab is billed by Fisheries and Oceans Canada as “one of the world’s 10 least wanted species.” They’re small (about 10 cm wide) but multiply rapidly, tolerate a wide range of salinities, and survive out of the water for up to two weeks. They disrupt ecosystems by voraciously consuming mussels and clams and decimating habitat for important species like Dungeness crab, wild salmon, and manila clams. Tunicates (commonly known as sea squirts) and bryozoa (tiny aquatic invertebrate animals) are at least as pernicious. These filter-feeders live on almost any underwater surface, including plants, other animals, and marine structures. Growing in colonies, they can quickly overtake kelp and seagrass beds, plug water pipes, and sink marine structures. Once established in a new area, they’re very tough to get rid of. 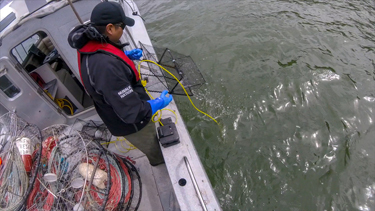 Keith, a Guardian Watchman from the Nuxalk Nation who is engaged with the CCIRA monitoring effort, retrieves a green crab trap. These traps are relatively costly, imported from Japan, and specially designed to minimize bycatch—provided they’re checked almost daily. Image courtesy of CCIRA. These problematic species have hitchhiked to oceans around the world, as larvae in ballast water on intercontinental shipping routes and on poorly cleaned boat hulls, fishing gear, aquaculture equipment, floating debris, and ocean currents. In May 2017 as part of MaPP implementation, CCIRA began building on the Heiltsuk Nation’s work over the past decade to eradicate green crabs around Gale Creek—by expanding it to include the other Central Coast Nations. More than 10 people (Guardian Watchmen and other fieldworkers) from the four Nations are now monitoring these aquatic invaders, collecting critical baseline data on their presence, abundance, and damage to the ecosystem. For green crabs, the monitors use traps specially designed to reduce bycatch, boating several times weekly to trap locations to record trap data and dispatch them (usually by freezing). Green crab have been found at 4 of 25 continuously sampled sites—but data suggest green crab are spreading more slowly than expected on the Central Coast. Is this because of Heiltsuk extirpation efforts—destroying hundreds annually—or because of deep, chilly conditions of the region’s many fjords? 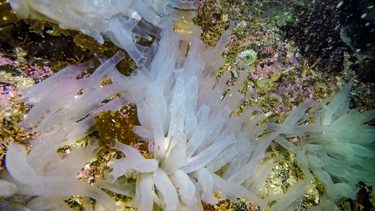 This translucent tube-shaped species of tunicate, Ciona savignyi, is one of many now appearing on the Central Coast. This filter-feeder consumes small organisms like phytoplankton, zooplankton, and the larvae of important species of fish and shellfish. Growing in colonies, it can reach a height of six inches and rapidly outcompete local species. Image courtesy of CCIRA. To look at tunicates and bryozoa, monitors suspend weighted plates 1.5 m below docks at Shearwater Marina—about 4 km east of Bella Bella and the hub of Central Coast marine traffic. “The goal is to sample areas with highest boat traffic, because that’s one of the ways they spread,” explains Blaine. After five months, monitors retrieve plates, record data on the observed tunicates and bryozoa in CCIRA’s database, and send five randomly selected plates to researchers at Fisheries and Oceans Canada for detailed analysis. The intent was to quickly train local stewardship technicians to do all baseline analysis, but it’s a very specialized process. There are only a few biologists in BC equipped to definitively identify these invasive species, using a microscope and working through complicated classification steps. 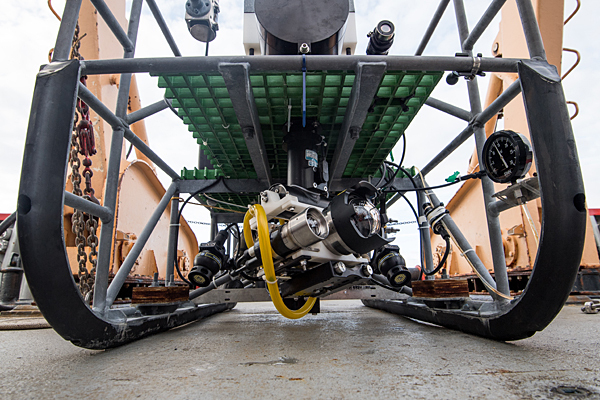 Each of the 22 1-cm2 points on a plate can host several tunicate and bryozoa species, and analysis of five plates can take a couple of days to complete. 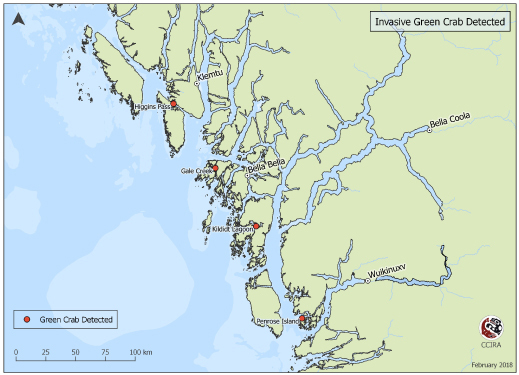 This map shows the locations where invasive green crab was detected in the Central Coast sub-region. Image courtesy of CCIRA. Data shared among Nations begs questions: If eradication of invasives isn’t realistic, can they be contained? Should regulations be strengthened and better enforced, and if so, how? How will climate change affect these introduced species? Some answers may come from a related MaPP-funded study on climate change that began in January at the University of Victoria, says Sally Cargill. She’s a marine planning specialist with the Ministry of Forests, Lands, Natural Resource Operations and Rural Development, and is the provincial co-lead on implementation of the Central Coast marine plan. “They’re looking at existing frameworks and tools for carrying out vulnerability and risk assessments that have been used around the world,” says Cargill, noting that risks include invasive species. “They’ll recommend assessments that could be applied to the MaPP areas.” The sub-regions could then decide to carry out detailed vulnerability and risk assessments in coming years—which could lead to actions such as additional monitoring, site restorations, education campaigns, and measures to protect aquaculture operations. 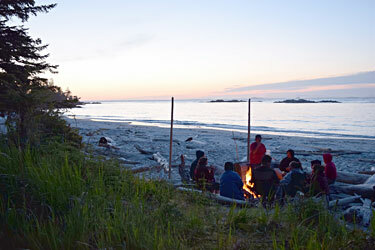 High school students learn traditional skills on a SEAS Outdoors Club camping trip to Goose Island in Heiltsuk territory. Photo credit: Johanna Gordon-Walker. For families who don’t own boats or lack the resources to get out on the water, Howard says the Supporting Emerging Aboriginal Stewards (SEAS) initiative fills a gap. 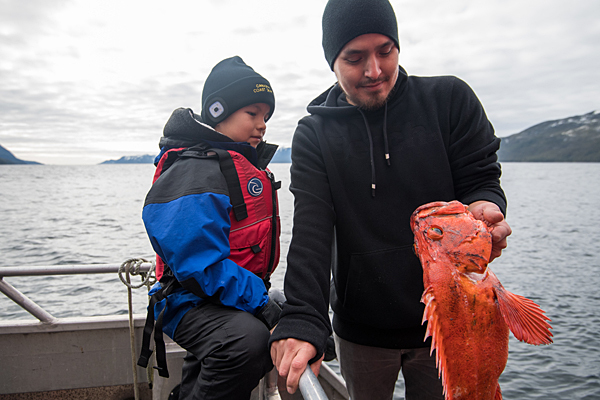 As a SEAS Outdoors Club mentor in Heiltsuk territory, he says the program helps prepare First Nations youth to become the next generation of stewards in their communities. First started in 2009, SEAS is active in the Heiltsuk, Kitasoo, Nuxalk and Wuikinuxv First Nations communities of the Central Coast of British Columbia. Classroom and outdoor activities are designed to cultivate a deeper understanding of traditional cultural beliefs and marine values. In line with the goals of the Marine Plan Partnership (MaPP), the SEAS Outdoors Club helps foster ocean stewardship. High school students learn practical skills in fishing, wilderness first aid and boat safety. They visit ancient clam middens and learn how important ocean resources have been to their community for thousands of years. The Central Coast Marine Plan includes objectives and strategies aimed at protecting and sustaining the region’s rich traditional and cultural resources by engaging young people in traditional use activities. SEAS brings elders into the classroom to demonstrate how to use plants as medicine and to teach the cultural protocols for sharing harvests with the community. Grade 4 students study herring science on the water. They learn how to set tree branches for herring roe and to preserve the eggs. Funding for MaPP supports SEAS program coordination, cultivating the next generation of stewards to carry out marine plan implementation. On this year’s first winter camping trip, students job-shadowed commercial crab and prawn fishers. At the end of the SEAS program, some graduates aspire to work with the coastal guardian watchmen or the Coast Guard. For others, learning to harvest ocean resources for their families makes them feel appreciated and gives them a productive role in their communities. The experience is rewarding for Howard, too. 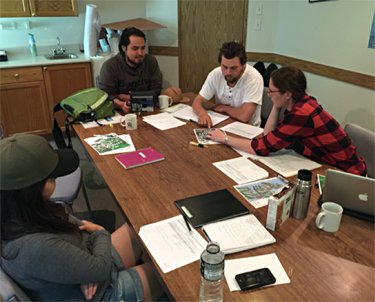 (Clockwise from top) Vernon Brown, Curtis Rollie, Anna Gerrard, and Chantal Pronteau review MaPP deliverables, discussing objectives and required actions and outcomes. Photo credit: Gord McGee. First Nations people have long understood that the use of natural resources needs to be carefully managed in order to remain sustainable. They recognize that species, ecosystems and humans cannot be considered in isolation – healthy environments and healthy communities go hand-in-hand. This has been a guiding principle in their relationship with nature for thousands of years. Today, the Coastal First Nations – Great Bear Initiative Coastal Stewardship Network is supporting First Nations in using monitoring and standardized data collection to demonstrate scientifically why this approach, known as ecosystem-based management (EBM), is so important to preserving the lands and waters for future generations. Chantal Pronteau and Curtis Rollie are guardian watchmen in the Central Coast’s Kitasoo/Xai’Xais Nation. This is the second year they have been monitoring and protecting their territory’s natural resources. Both live in Klemtu but are stationed in remote Mussel Inlet for three months of the year and spend an additional three months monitoring the rest of their Nation’s vast area. 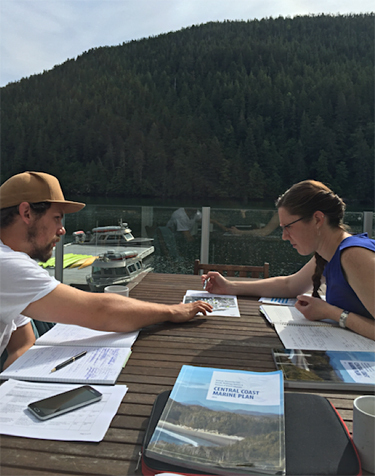 With support from the Marine Plan Partnership (MaPP), Rollie and Pronteau took the first level of the Coastal First Nations Stewardship Technicians Training Program and are now participating in Level 2. The training includes 14 courses that develop a variety of skills including environmental compliance and monitoring. Kitasoo/Xai’Xais Nation Guardian Watchman Curtis Rollie (left) and Marine Plan implementation coordinator Anna Gerrard go over the upcoming guardian watchman schedule and responsibilities. Photo credit: Gord McGee. EBM monitoring is a priority for near-term implementation of the MaPP Central Coast Marine Plan, and Rollie and Pronteau collect data to support a variety of indicators including key species as well as noting human pressures on the ecosystem. They enter their findings on tablets and upload the information to the Coastal First Nations Regional Monitoring System (RMS). Lara Hoshizaki administers the database that guardian watchmen such as Pronteau and Rollie upload information to. As the regional monitoring system coordinator, she works closely with the six Coastal First Nations that use the RMS and provides monthly reports. Kitasoo/Xai’Xais Nation Guardian Watchmen Curtis Rollie (left) and Chantal Pronteau (right) work with the Coastal Stewardship Network’s training coordinator Elodie Button (centre) to measure ocean pH in their Nation’s territory. Photo credit: Curtis Rollie. An EBM framework guides the implementation of many of the MaPP strategies and the work the guardian watchmen perform is important to its success. Through training, MaPP is building capacity to collect data related to EBM indicators. This improves monitoring and enforcement and measures long-term changes in ecological and human well-being. We know a lot about forests and the important role they play in our environment and our economy. But what do we know about underwater forests – the nutrient-rich kelp forests found along the North Pacific Coast? Applied marine ecologist Anne Salomon, who studies kelp forests, calls them one of the most productive ecosystems on our planet. 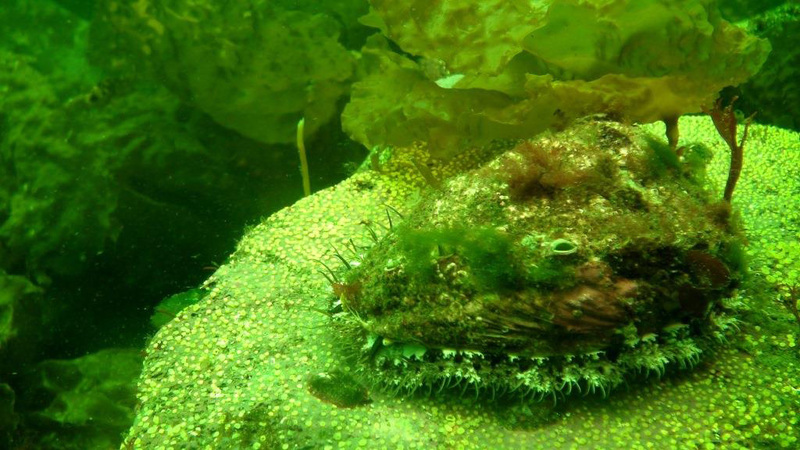 They provide habitat for rockfish, abalone, sea urchins and many more marine species. Kelp forests are also a source of food that fuels marine food webs and they help to calm the waters on wave-exposed outer shores, providing a safe haven or nursery for tiny larvae, fish and shellfish. Salomon is an assistant professor at Simon Fraser University in the School of Resource and Environmental Management and a member of the MaPP Central Coast Marine Plan Advisory Committee. 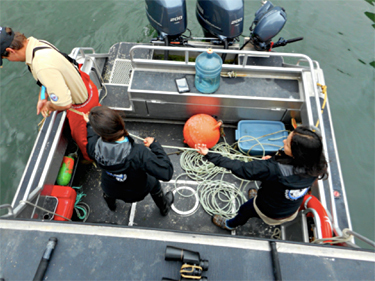 She is also one of the principal investigators of the Hakai Network for Coastal People, Ecosystems and Management. Housed at SFU, it is a network of Canadian and international scientists that works with the Hakai Beach Institute on Calvert Island off the central coast of British Columbia. Hakai and its funding body, the Tula Foundation, are the brainchildren of Eric Peterson and his wife, Christina Munck. A fourth generation British Columbian, Peterson is an early-stage entrepreneur who thinks long-term. He is a geneticist and molecular biologist who is used to examining things in detail. He is a former McGill University professor who worked in B.C.’s coastal resource industries in his student years. He is also a successful tech entrepreneur who sold his commercial interests to establish the Tula Foundation. Peterson’s commitment to long-term research is valued by scientists who often are funded for shorter time spans. “It’s a huge amount of foresight to provide long-term funding because you can only detect change with long-term monitoring … we need data that go through time,” Salomon says. She adds that the type of data collection that Peterson helps to fund through the Hakai Beach Institute over time will assist scientists in assessing the effects of initiatives such as MaPP. 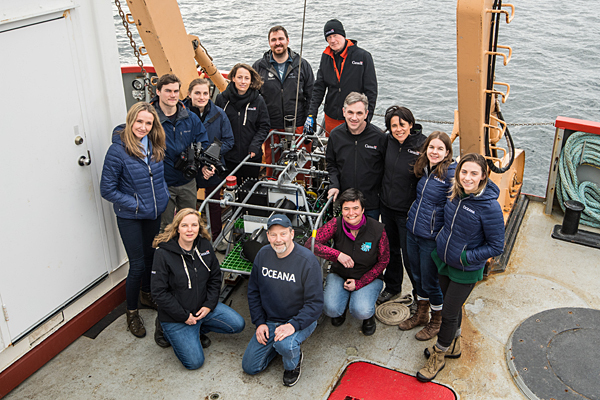 Recently, Salomon and a number of other scientists launched the Outer Shores Research Program. Funded by the Tula Foundation, the program works in collaboration with the Hakai Beach Institute and Central Coast First Nations, including the Heiltsuk and the Wuikinuxv. 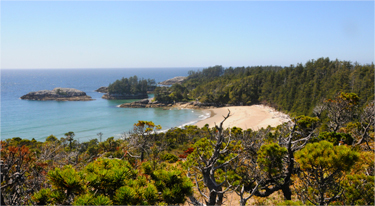 “The whole idea of the Outer Shores Research Program is to understand the major drivers of changes and their effects on near shore coastal ecosystems (including kelp forests and eel grass meadows) that people rely on – for sustenance, for cultural values, for economies,” Salomon explains. See video of underwater kelp forests. 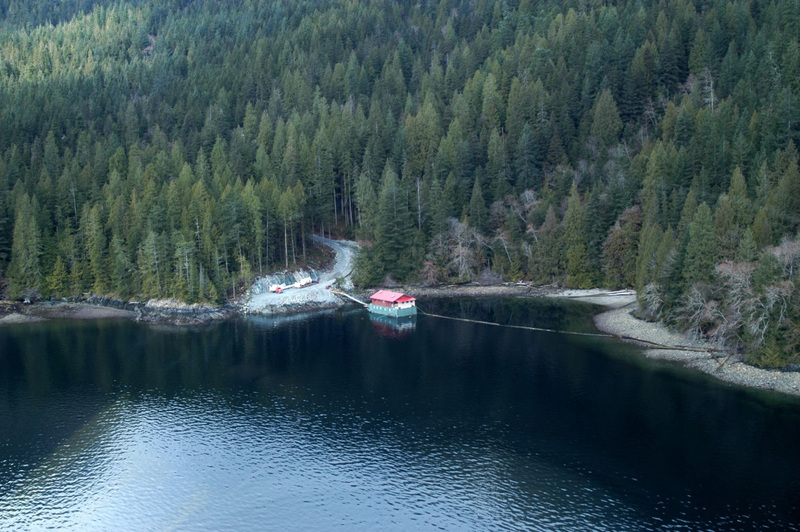 See the rugged coast of Calvert Island from helicopter. Hakai – The Rugged Coast from Grant Callegari on Vimeo. A typical small log dump found today. A protective debris curtain to the right of the float camp is designed to protect the beach habitat. A two-year old artificial rock reef used to compensate for log dump impacts. Shellfish in foreground is endangered abalone. How do First Nations, the forest industry and the provincial government work together to manage logging in the Central Coast? And, just as importantly, how do they protect the environment while they’re doing it? In response, Warren Warttig quotes a university professor: “Forestry isn’t rocket science – it’s much harder than that,” he notes. Warttig is the senior planning biologist with the forest company Interfor, and a member of the Central Coast Marine Plan Advisory Committee. The challenges surrounding forestry are particularly critical in the Central Coast Region, he says, where about 50 per cent of the land is either park or protected and an additional 35 per cent of the productive forest land-base is constrained by some form of protective legislation. In the old days, when understanding of how to protect the environment was less acute, forest companies typically dumped their logs into well-developed estuaries. “We now recognize those areas as some of the worst places to put log dumps,” Warttig says. Now there is a ‘no-net-loss-of-habitat’ policy in place, established by the federal department of Fisheries and Oceans (DFO). When forest companies have an impact on habitat they are required to replace it with a compensation habitat. “We’d find an area and build a rock reef which, if done right, can produce some pretty nice habitat – particularly for abalone and rock fish,” Warttig says. Visual impact is a whole additional matter, addressed through forest legislation. Forest companies now have software allowing them to accurately model what an area will look like after logging. Six different forestry companies operate in the Heiltsuk territory and the First Nation hopes to make formal agreements with all of them. “We have a fairly vigorous checklist of requirements from industry and the province that we set out in the agreement itself,” Brown says. Spirit bears bring international tourists to remote B.C. Doug Neasloss was a kayak touring guide in the remote village of Klemtu, found on Swindle Island in B.C.’s Inside Passage (between Vancouver Island and southeast Alaska). Neasloss had just closed up shop for the 2003 season, when he got an unexpected visitor. This experience helped turn Neasloss into a photographer himself (he’s completely self-taught) and also sowed the seeds for what is now The Spirit Bear Lodge, a thriving eco-tourism business run by the Kitasoo/Xai’Xais First Nation. The operation brings in about 300 visitors each year, many from Europe and Australia and employs 40 local people – mainly youth. The heart of the enterprise? Interest in the region’s estimated 200 highly prized spirit bears. This majestically coloured white animal – that used to be, wrongly, thought of as a rare albino – is a sacred animal to the First Nations people. Today scientists know that the spirit bear’s unique colouring is the result of a double recessive gene found in black bears. A white spirit bear can have a black cub and vice versa. 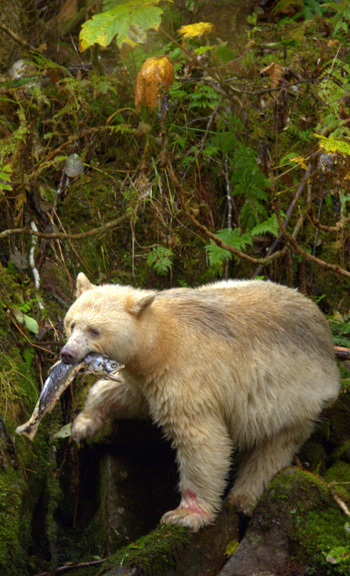 The spirit bear survives because of its isolation from other bears, namely grizzly bears, and an abundance of salmon in intact estuaries. These key characteristics are essential to Neasloss – and to the success of the lodge. In fact, it’s one of the reasons he’s been so active in government-related work. A marine use planning coordinator for the Kitasoo Band from 2005 to 2011, he helped the community develop its own marine use plan. “We’ve been doing a lot of work on behalf of the bears,” he says, arguing that marine protection is just as important as land preservation. Why? Because bears depend on salmon. The community is happy with the spectacular lodge it built in 2007 and looking forward to continuing to grow its business.